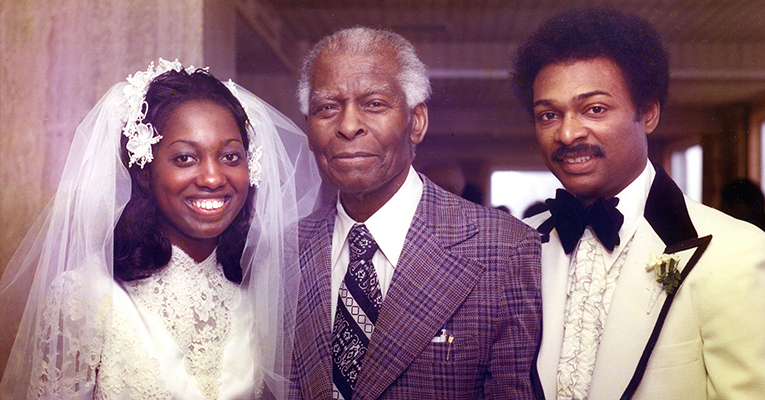 This is the first in a series of weekly profiles celebrating Black History Month at Sweet Briar. If there’s a trail to blaze, Marshalyn Yeargin-Allsopp will find it. 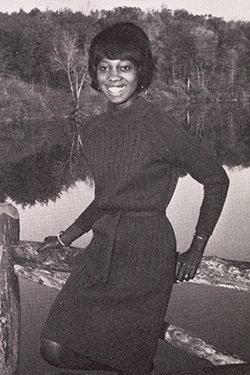 In 1966, the 17-year-old from South Carolina was the first African-American student to enroll at Sweet Briar College. Sweet Briar had been trying for two years to amend the will of its founder, Indiana Fletcher Williams, so that it could admit not only white women, as prescribed in the 1900 document, but women of all colors. A temporary legal victory — which allowed Yeargin-Allsopp to enroll — finally became permanent in 1967. And why would she? There were bigger, more personal things on her mind. Well, there was one in particular: medical school. A bright young woman raised by two teachers in Greenville, S.C., Yeargin-Allsopp had started college at age 16. She was a freshman biology major at Bennett College in Greensboro, N.C. — an excellent school, she says, but not quite what she was looking for — when Sweet Briar crossed her path. She was right. Once enrolled, Sweet Briar’s curriculum proved quite difficult for the biology major and chemistry minor. She felt less prepared than her white classmates and made only mediocre grades initially, but it didn’t matter: Nothing would keep her from reaching her goal. “I had no social life, but I was not concerned about that. I was focused on doing well and getting into a top medical school,” Yeargin-Allsopp says. And so she did. In 1968, she graduated Phi Beta Kappa from Sweet Briar and became the first black female student to enter Emory University School of Medicine. Her experience at Sweet Briar, it turned out, served as the perfect launching pad. 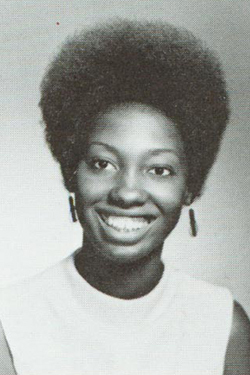 The young medical student excelled at Emory, graduating in 1972. An internship and residence at Montefiore Hospital in the Bronx, N.Y., followed, along with a fellowship in developmental pediatrics at Albert Einstein College of Medicine. In 1978, Yeargin-Allsopp accepted a clinical fellowship at the United Cerebral Palsy Research and Educational Foundation and in 1981, she began her career at the Centers for Disease Control and Prevention. Over the next few decades, she would publish numerous papers on the epidemiology of developmental disabilities. She also designed and implemented the first U.S. population-based study of developmental disabilities in school-age children in an urban area. Her study served as the basis for an ongoing CDC developmental disabilities surveillance system, which identifies children with cerebral palsy, intellectual disability, hearing loss, vision impairment and autism. To maintain her clinical experience, she also served as the medical director of the Clayton Early Intervention Program in metropolitan Atlanta from 1985 to 2013. 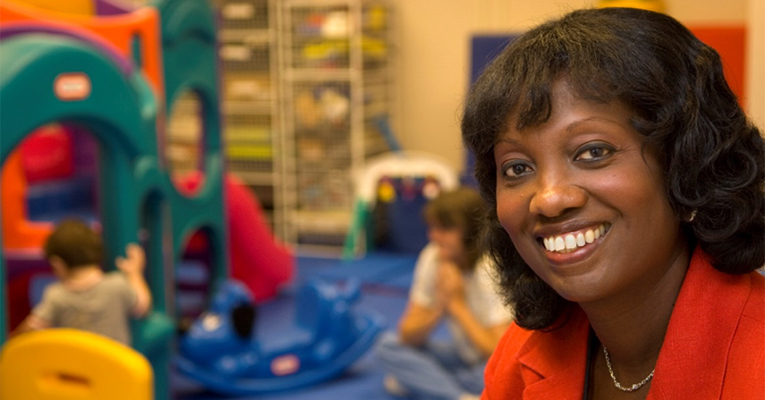 In 2008, the American Academy of Pediatrics gave her the Arnold J. Capute Award for her work in the field of children’s disabilities. Today, Dr. Yeargin-Allsopp is associate director for children with special healthcare needs in the Division of Congenital and Developmental Disorders at CDC. She was chief of the center’s developmental disabilities branch for more than 15 years and continues to speak to audiences across the country and internationally about CDC’s work. She lives in Atlanta with her husband, spends time with her children and grandchildren, and volunteers with several community service organizations. She also serves as an adjunct professor of pediatrics at Emory University. Last year, she received the Lifetime Achievement Award from the American Academy for Cerebral Palsy and Developmental Medicine. Her alma mater is proud of her, too: In 1992, she was honored with Sweet Briar’s Distinguished Alumna Award. In many ways, Yeargin-Allsopp’s life has turned out much bigger than she imagined in 1966. It’s amazing what dreams and grit can do, given the right environment. “I was not a leader at Sweet Briar, but I became a more determined young woman,” she says. “I was actually very shy. But, when called upon, I stepped up and overcame my self-consciousness. That was a learning experience for me in terms of leadership. I think many of us have a lot within us, just waiting to be tapped, when the time comes. 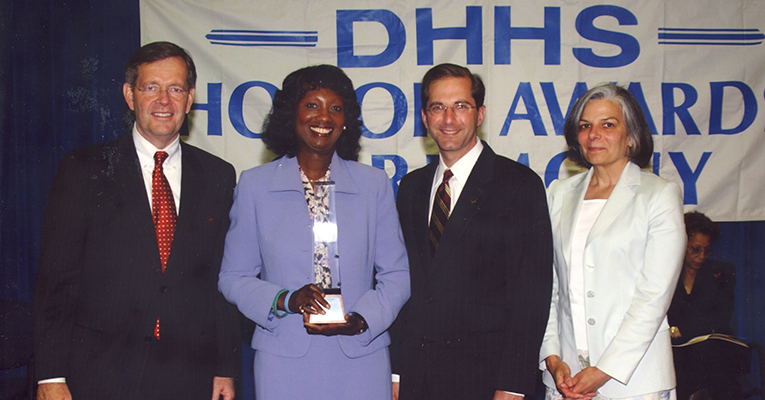 Yeargin-Allsopp and her Autism Public Health Response Team receive the HHS Secretary’s Award for Distinguished Service in 2004. Yeargin-Allsopp says it’s a privilege to bring some of that leadership back to Sweet Briar, where she is currently serving a second term on the board of directors. “Sweet Briar, as we all know now, if not before, is a very special place,” she says. “No person or institution gets everything right all the time. But, the story of Sweet Briar — the determination of the school in the ’60s to integrate and the determination of the alumnae to not let the doors be closed forever — is just an amazing story.